I've been waiting since December for a day like this. Sunny. Frozen. A light coat of fresh snow on the ground. I woke up this morning at 5:30 and my first thought was, This is the Day! What day would that be? 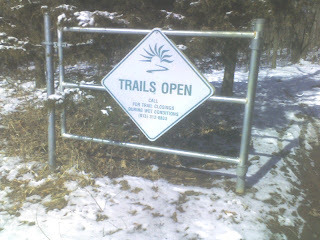 The trails were open and runnable! 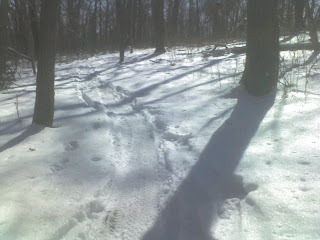 Tomorrow they won't be as our Kansas temps melt the snow and leave the trail a muddy, clammy mess. But today the trail was tire-treaded to a crispety-crunchety ribbon through the woods. What surprised me most about the snow-covered woods is the sound they make. In the summer, the woods host many voices: leaves and branches tossing, animals jumping and rustling, birds and their warbly come-hithers, people riding and hiking. In the absence of all this sound the snow-covered woods have their own voice. It's not audible exactly. It presses on one's breastbone. It impels. Farther, faster, deeper, YES. I ran through the woods, picking up my feet as lightly as I could, feeling my heart pound harder until there was nothing but heartbeat and snow, nothing left of anything left behind, anything noisy or cracked hushed and run to ground. At one point I was so happy that I just stopped and jumped up and down like a little kid. It was great. Three of the Planet's Happiest People, MTB'ers, were out there too. Gigantic smiles. 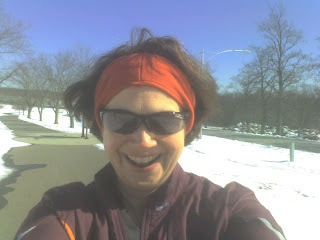 Here, I can show you, this is how excited I was to get to run in the woods again. There is no "after" picture as I was hustling to get back to work. You will have to take my word for it that my smile was even bigger. And that my hair did not stay stuck like that.